Illegal Immigration Facts, Statistics, and polling data from certified polls! ALIPAC's collection of polls, surveys, information, facts, polls, and statistics about illegal immigration for 2015, 2014, 2013, 2012, 2011, 2010, 2009, 2008, 2007, 2006, and 2005. Join our E-mail alerts to receive more Facts & Statistics about illegal immigration! 60% oppose Obama and GOP leadership on immigration reform amnesty according to a new Pew Research poll. With 60% opposed, the poll also found "only about a third of the public (32%) approves of the job Obama is doing on immigration policy." Only one in eight swing-voters strongly back amnesty, says Obama’s own polling firm! Supporting immigration reform amnesty for illegal aliens is a big campaign loser for any district where swing voters are a concern. This middle non-partisan bloc comprises 51 percent of all voters found that just 12 percent of these middle-bloc respondents strongly support “providing illegal immigrants with a path to citizenship even though they have broken the rules,” while Thirty-eight percent of the middle-bloc strongly oppose the amnesty, creating a political minefield for the politicians who need to woo swing-voters. While those strongly opposed to amnesty dominate the strongly support group 38% vs 12% or 3 to 1, overall swing voters were 32% leaning amnesty and 54% leaning against! Illegal Immigrants will vote 8 to 1 Democrat if ever given citizenship by legislative amnesty such as the one contained in S. 744! Prior to citizenship 31% of illegal aliens identify as Democrats and just 4% as Republicans. For those already given amnesty, illegals in the US under ten years, 26 percent identified with Democrats against 9 percent for Republicans; for those who’d been in the US for over two decades, 54 percent identified as Democrats and 10 percent identified as Republicans. 67% of U.S. voters say that "illegal immigrants are a significant strain on the U.S. budget." Of voters polled, two-out-of-three (66 percent) said the availability of government money and services draw illegal immigrants to the United States and 68 percent said gaining control of the border is more important than legalizing the status of undocumented workers already living in the United States. Of particular importance, 80 percent of voters said the issue of immigration will be somewhat important in determining how they will vote in the next congressional election; half (50 percent) said it will be very important to them. (Rasmussen Reports, March 3, 2010). 71% of Americans want to see the bosses who hire illegal immigrants arrested while 64 percent support police conducting surprise raids on businesses suspected of hiring illegal immigrants (The Raids Obama has stopped) Rasmussen Reports poll, October, 2009. 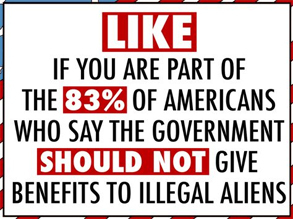 80 percent of U.S. voters oppose proposals for government-backed health-care plans for illegal immigrants Rasmussen Reports poll, June, 2009. 73% of Americans called for a drop in the number of illegal immigrants CNN/Opinion Research Corporation poll, October, 2009. Please join our e-mail alerts here at ALIPAC.us to receive updates when more illegal immigration facts are added to our list!